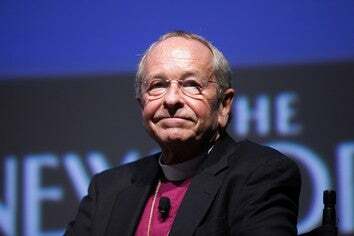 After using his gayness to destroy marriage, ruin the Episcopal Church, and blow up heaven, the first openly gay Episcopalian bishop announced today that he plans to retire after the conclusion of his term. According to the Times, V. Gene Robinson has occupied the office since 2003, when his election as bishop catapulted him into the middle of an international controversy. Liberal voices hailed the election as a positive step toward building a faith community that values acceptance and love over intolerance and hate. Conservatives in the church disapproved of his appointment and threatened to break from the international governing body, claiming that Robinson's sexual orientation was in direct contradiction to the message of the Bible (I hope, for the sakes of their eternal souls, that they were not wearing fabrics made of blended fibers at the time, which directly defies Leviticus chapter 19, verse 19) and occasionally threatening him with death (which I'm sure Jesus was totally down with, since he's famous for being all, kill everyone you don't like). In 2009, Robinson delivered the invocation at the opening event of President Obama's inauguration. This announcement was unexpected (Robinson's young and vibrant for a church official, just less than ten years shy of the mandatory retirement age for bishops), and came on the heels of what Robinson describes as a general feeling of fatigue from subjecting himself and his family to the level of stress of being "the gay bishop." Post-retirement, Robinson plans to continue being a public voice for gay rights and to work to bring those alienated from Christianity back to the faith. His official term ends in 2013. So the bad news is: there is still stupid, blind bigotry out there strong enough to compel someone to threaten another human being's life on the basis of sexual orientation, there are still people out there who honestly believe that God thinks that gays will totally ruin everything and that it's just dandy to murder them and stuff. The good news is that there are people like Robinson out there who are able to stand up to it, if only for a short period of time.